We booked on VRBO and it was a great experience. Simply easy process. Emails with all information were sent on time. As well as emails on how to check out!! Property was clean and very well maintained!! Great condo, well appointed and had everything we needed for a perfect vacation! Sweetgrass did a great job in helping us find the right rental to fit our needs. The property was fabulous, check in was smooth, and we experienced no problems during our stay. We will certainly contact Sweetgrass when we return to Kiawah Island!!! The property was very clean, everything was in great condition, and the furnishings were very nice. We really enjoyed our mornings and evenings on the screened porch overlooking the lagoon. We were only minutes from the beach and the bike trails were nearby. Cant wait to return. All communication was pleasant and sent through email. Everyone was helpful. This 2 bedroom condo is in a great location across from the beach club. Perfect with kids. Awesome balcony we enjoyed and comfortable living quarters. This home is so spacious and comfortable we all felt immediately right at home. The home is well appointed and looks exactly like the online photos. We did a lot of cooking and especially loved dining all together, either inside or outside at large dining tables. The wrap around screened in porch was our favorite place to enjoy playing games all together. Each of the five bedrooms having its own attached bathroom is ideal. This home is close to the beach, biking trails, golf, and island shopping. We will definitely return. We went for a long weekend with college friends and this property was perfect. It is very close to a beach access, which may not be apparent on google earth. Having rented lots of properties on Kiawah, I understand how important this is. There are numerous indoor gathering spots in this house, so lots of living areas, easily accommodated 10 people. The pool and deck are a great gathering spot with a view of a lagoon and part of Osprey GC. I have been using Sweetgrass Properties for three years now. They are always very professional, helpful and always a pleasure to work with. This year, they responded to a problem in the condo within 15 minutes. I was shocked at the speed of the response and very happy that the problem was resolved. This is our third year renting 8A Seagrove. It is beautifully decorated; it has a coastal decor without being overwhelming. (I love all the art work.) 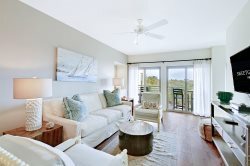 We love the openness of the living area, the well-equipped kitchen, the very, comfortable king size bed, the 1 and 1/2 baths and especially the wonderful ocean views. The covered deck is also a plus and the complex, itself, is very quiet. We will be back again, next year. 101 Goldeneye is just the perfect spot on Kiawah Island. We recently celebrated my husband's retirement with friends on Kiawah and this was an outstanding home to rent. It is set on a beautiful, large lot at the end of a quiet street, only a short walk to the beach. The home was spacious and bright - windows everywhere letting us take in the view. It has a sprawling living space flowing from the living room into the dining room and on into a large kitchen and family room. The 4 bedrooms were large and spacious with a 5th huge bonus room for watching TV or playing cards. It has an extra sleeper sofa for additional sleeping space. The highlight of the home is the pool, located on the large, tiered deck which overlooks a lagoon and the Osprey golf course. We spent many hours on the deck enjoying breakfast and cocktails! The home is very well stocked from champagne glasses to spices to cooking utensils. We really enjoyed our stay and can't wait to come back when it's warmer and spend lazy days by the pool! They were very helpful and quick to respond with any questions. Love this house! Everything is perfect. The Sweetgrass team members work very hard to make your stay enjoyable and worry free. Quiet, well maintained. Great location, within walking distance to the beach. Property and Management company are great! Details of our stay were given prior to our visit, which was very helpful. Property was clean and very nicely decorated. Great location, all the furnishings you need.unit in good shape. The members of the Sweetgrass Properties team communicated well. We received the email outlining arrival instructions just as stated. 7 Ocean Green is a wonderful property and would recommend it highly. The highlights of the home for our family were the expansive screened in porch off the kitchen, balcony/ screened in porch off the two upper floor bedrooms, a full bath for every bedroom and a well stocked kitchen. The kitchen had everything one needs to make meals for a family..even a crockpot! The location is close to the beach, Sanctuary and Turtle Point Golf Course. We love the Ocean Green neighborhood, it is quiet & kids can ride bikes without much traffic. Came in late at night when dark and went to Sea Cabin units by mistake and Sweetgrass employee very helpful on the phone when we called... getting us to the correct building. Our stay was very good. Mostly quiet. Unit clean and tastefully decorated. The property was very clean and beautifully decorated. We selected the property because of the easy access for our family members with some physical challenges. The elevator, walk in shower in the master and lack of steps was what we were originally looking for and the condo checked all of those boxes. We had an issue figuring out our TV and Christina responded immediately. She took the time to stop by the house and help us out. I also called Sweetgrass for a few other items and they were very responsive. Overall we had a very relaxing and enjoyable stay on Kiawah and at 5 Silver Moss. This was our first stay on Kiawah and our son was on Spring Break from the CofC so we made a family vacation out of it. There were 5 adults and 2 small dogs and the house was very spacious. The beds were comfortable and there were plenty of blankets and pillows. The location of the house was also great - it was a quiet cul-de-sac with a short walk to the beach. Allowing pets was a plus.